It’s taken me a while to make a statement on the issue. Out of the many reasons why, the one that stands out the most is that American Muslims tend to condemn non-practicing Muslims. Although the numbers of practicing Muslims is lower than we’d like to admit, many American Muslims are not willing to admit that a woman without hijab also has a place in our community. And often, they can represent our community in different ways, then say a practicing Muslim woman who wears full hijab and doesn’t mix with men. Muslims in America woke up to some happy news today – the new Miss USA is Muslim! Rima Fakih of Dearborn, Michigan, is a Lebanese immigrant whose family celebrates both Muslim and Christian faiths, according to the Associated Press. Last night, she made history by winning the Miss USA 2010 crown. So many people were obsessed about Rima as a new Muslim celebrity who could open up discussions about Islam. But I wonder why the Arab community never backed some prominent women in the media who also have Muslim heritage. I have some important questions: What if Rima Fikah came from an African American Muslim family in some place like Philly? Would the American public, let alone the Muslim community, have been so forgiving about the pole dance? Would altMuslimah and Muslimah Media watch feature articles saying that her victory was a sign that Muslims were part of America too or that she could open up discussions about Islam? Could these women of African descent and Muslim heritage create a chance for discussion about Islam and American Muslim’s place in this society? Do we buy Eve’s albums and celebrate her as the first lady of Muslims in Hip Hop? Did we watch her show or bring her up in discussions with friends to show them that Muslims are just like everybody else? 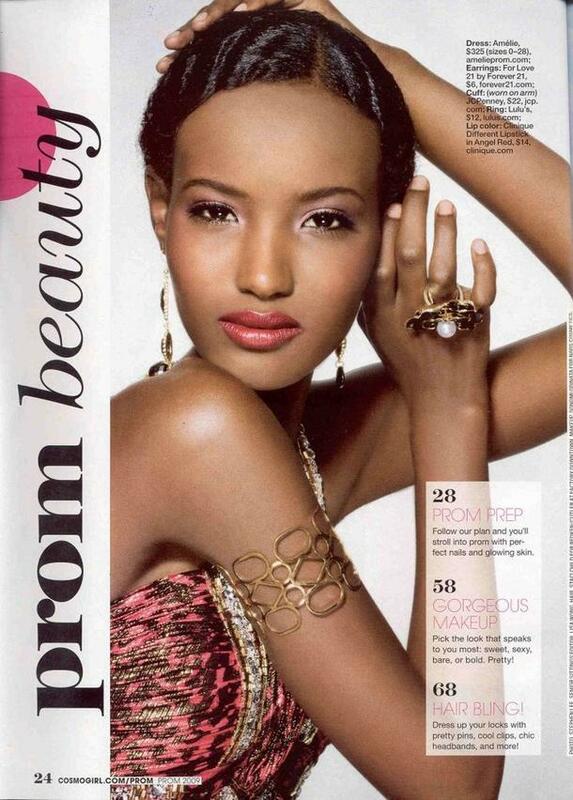 Did we watch and support Fatima Siad who made it to 3rd place in cycle 10 of America’s Next Top Model? She was born in Mogadishu, Somalia. Did this start off discussions about the diversity of the immigrant Muslim community? Or what about an even more famous Somali American? Do we consider her status as super model as a sign that Americans accept Muslims? Do we Love that Girl! Who has Afro-Panamanian and Indo-Trinidadians descent? Does her family history spark an interest in the Indian diaspora and the role of Islam in the Caribbean, in addition to Caribbean Americans? Do we watch and support Laila Ali, in her professional Boxing matches? Better yet, did we vote for her on Dancing with the Stars? She the daughter of one of the most iconic figures of African American Muslims, Muhammad Ali. But yet, do we see her strides in sports as reflecting a type of Muslim feminism? I had two problems with the discourse on Rima Fakih and Miss USA: first, my Arab peers who expected me to celebrate this as a Muslim victory that demonstrates we Muslims are part of America too; and second, the Muslims who expected me to be angry because a Muslimah should not parade around in a bikini. Both stances assumes one thing, that being born into a Muslim family means that you are Muslim. And it also sends a stronger message, that all Arab issues are synonymous with Muslim issues. Often we are too broad in accepting every thing that people with Muslim heritage do as reflecting Islam in general. This is especially the case when it comes to Arab, Pakistani, or Indian Muslims. The women featured above are not seen as reflective of the state of Islam in America. as a white muslimah who has been in the community for almost eight years, i’d have to say that it seems arab and south asian immigrants/cultures drive the muslim american “cause.” i feel like they’re the gatekeepers of the wider understanding of american muslims. do you think part of the issue is that the women you listed above are seen as “black” before “muslim?” it seems as though when controversy is stirred up by arabs/south asians…they’re first seen as “muslim” and then by their respective ethnicity. I’d have to agree with you. They are seen as the most authoritative voice in defining what causes are “Islamic” and which ones aren’t. Arabs and South Asians are seen as Muslim first. As long as they don’t denounce Islam completely, they are still considered to have legitimate expressions of Islam. Hence Irshad Manji and Asra Nomani’s opinion on issues of reform in Islam hold far more weight than scholarly women like Aminah McCloud, Ingrid Mattson, or Aminah Wadud. The only African woman who still can weigh in is Ayan Hirsi, and that’s because she’s a pawn for Islamophobes. You make excellent points in this post. (I for one had no idea that Eve was Muslim… wow!). but for a number of reasons it does seem that in America and a lot of Western contexts Muslim= Arab/South Asian. uptown girl brings up a good point, who has decided that the identity that deserves primacy for people of African decent is their African identity (I have even heard Iman referred to as African-American ;-/ ) While at least of late Arabs and South Asians are Muslims first? These are ideas and concepts that as I understand took centuries to form and they will not be easily dismantled. I am also wondering how often and when do the women above and those like them acknowledge their “Muslimness?” of course it’s not a straight analogy since Fakih probably gets a “Muslim” question at every interview. sigh. I think you bring up good points. My primary issue is that a South Asian or Arab does not have to bring up their Muslimness. They can even downplay it. But still, they will still be seen as representative of Islam. African Muslims are often seen as second rate Muslims. Their expressions of Islam are not seen as legitimate as whatever is broadcast out of the Middle East. How many American Muslims are taking fatwahs from West African shuyukh? That’s a whole other issue, but it is worth bringing up. Why Eve has arab middle name I’m not sure but she is not a Muslim and never was. After finding her name on several lists of Muslim celebrities, I tried to look up articles on Eve and Islam and nothing came up. I guess my search missed this article. Will make the correction. Wow; your perspective is the best one I have read! My husband is caught in the middle, please read the recent post on my blog for details. As a white Muslim he has had the States turn on him and the Muslim community acts as if he doesn’t exist. After reading your blog, I understand where you are coming from. The Muslim community doesn’t really help us deal with these situations. While the community likes white American talking heads, it does little to address the specific issues of white converts. There are few resources of support, even though child custody and parental rights in international situations are major problems. You’re in my du’a Umm Adam. Your husband is blessed to have you in his corner. I think we draw a fine line between accepting people into the Muslim community and respecting their wishes to keep their religious beliefs/ practices private. Because we know that as soon as someone, especially a woman, steps forward who doesn’t fit the Cookie Cutter Muslimah mold steps forward, a storm of judgement will rain down on her head. Can you imagine the outraged response if any of the women pictured in your post talked about themsleves as Muslimahs? I think the outraged ones fear that us weak minded sisters would throw off our hijabs in emulation or something. As for if Muslimah Media Watch would cover a similar story if it involved a black sister, I’d like to think we would, as we do try to be representative. However, I’m going to point the other writers in the direction of this post for further consideration. Also, MMW is always looking for new writers or pieces, especially from someone as talented and thoughtful (masha Allah) as yourself. AFAIK, Eve has read the Qur’an and stated that she found it beautiful, but that she felt she couldn’t commit to a Muslim lifestyle, so she didn’t want to be a hypocrite. But I do not know what she actually believes. Allahu Alim. I didn’t know ANY of those women are Muslim! I wonder how they self-identify – Muslim first or Black first, or some other way. I always assumed Muhammad Ali’s children were raised Muslim. Wouldn’t you think that one of the greatest icons of American Muslim would have at least some Muslim children?Does it matter what they self identify as first? I didn’t get a sense that Rima self identified as Muslim first, then Arab. The issue is that it really doesn’t matter for South Asians and Arabs in most people’s view. But when it comes to Black identities, we’re supposed to chug away that label in order to assert our legitimate Muslimness. I know this for a fact based on experience. My Arab friends who didn’t wear hijab hardly ever got their Muslim identity called into question. Whereas, when I didn’t wear hijab but asserted my Muslim identity it was often called into question. Even wearing hijab, people call into question my muslim authenticity. I find that ironic because faith is a matter of personal choice, one has to choose to take shahada. I don’t know what’s in people’s hearts, but you can be born into a Muslim family and participate in a Muslim dominated culture without having any faith whatsoever. Jazak’Allah sister. This is one of the best writings that I have read on this issue. May Allah give you Jaza for this. One the issue of strong coupling between Islam and ethnicity, South Asians and Arabs do get a pass. What people do not realize is that over the course of time the Muslim identity for these people who are given a pass may become weaker and weaker until it becomes non-existent.